Following the sublime family-friendly animation of The Fantastic Mr. Fox and his invigoratingly romantic paean to young love, Moonrise Kingdom, Wes Anderson has reversed course and returned to the world of decidedly adult filmmaking. 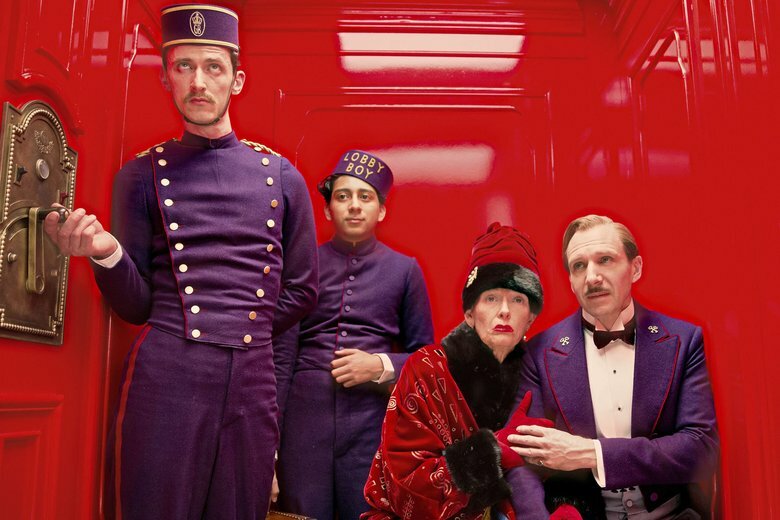 And not only is his latest, The Grand Budapest Hotel, his first R-rated effort since the wan misfire The Darjeeling Limited (2007), but it is his largest, most ambitious, and yes, even his most aesthetically-driven film to date. Anderson has always thrived on creating vividly realized worlds for his characters to inhabit, and this time he’s created an entirely fictitious country, a European nation named Zubrowka, plus a fictionalized narrative of how it was ravaged and reshaped by the wars of the 20th century. Anderson’s scope has never been broader nor have his ideas been more grand-scale; this is a film concerned—in its own storybook way—with questions of historical narratives, racial and national identity, class privilege, and the unyielding brutality of war. Consequently, it is perhaps Anderson’s chilliest and least emotionally intimate work, which seems especially evident following the generous and open-hearted Moonrise Kingdom. But it also represents a significant step forward in his trajectory as a director, proving that his very specific and unapologetically whimsical filmmaking devices needn’t restrain him from work of effective gravity and, dare I say, importance. Which is not to say that he doesn’t still lay it on pretty thick with the cuteness. At this point it would be more notable to point out if an Anderson film actually deviated from his stylistic norms, so let’s just say that this one does not. In what initially feels like an amusing if unnecessary nesting-doll narrative structure that gradually begins to seem like a commentary on historical storytelling, The Grand Budapest Hotel has no fewer than four separate points on a timeline that spans 80 years. It opens with a young modern-day woman visiting the decorated bust of an author while clutching a copy of his book, which shares the title of this film. It then jumps back to the ’80s to show the author (Tom Wilkinson) reading from the book, which is itself the narrative of having another story told to him. We then leap back another 20 years to watch the author, now played by Jude Law, experiencing what becomes the basis of his book. While staying at the titular hotel (which, in its kitschy-mod ’60s incarnation, is destined to inspired massive renovations at Ace Hotels throughout the country), the author meets its proprietor Mr. Moustafa (F. Murray Abraham). The two men sit down to dinner, and Mr. Moustafa regales the author with the story of how he came to be the hotel’s proprietor—and so, one last time, we jump backward in time, to the 1930s, the period which at long last serves as the core of the film’s story. It will understandably take the viewer a bit of time to fully invest in this part of the storyline; one must first trust that Anderson won’t whip us back yet another several decades just as we’re getting settled. But fear not, you can relax and dig in once you reach this innermost doll. The narrative Mr. Moustafa relates to the author is partially about him, but more so, it’s about Gustave (Ralph Fiennes), a legendary concierge at the hotel who took young Moustafa (played here by Tony Revolori) under his wing. Moustafa first came to the hotel as a teenaged Arab immigrant seeking work, and Gustave—a deeply fastidious and profoundly committed concierge whose disciplined devotion to the customs and rituals of the hotel was unparalleled—decided to hire him as a lobby boy, rechristening him as Zero. Gustave’s unswerving conviction that dignity in its most humane form can be found in strict adherence to etiquette and hospitality gives the film its emotional backbone. Fortunately, he is also a flawed and very fascinating man; one of his quirks involves his tendency to engage in rapturous trysts with the hotel’s wealthy older female clientele. One such elderly paramour, Madame D. (played by Tilda Swinton in a brief appearance all the more hilarious given the staggering amount of old-age makeup required for such a short amount of screen time), unwittingly embroils Gustave in a highly contentious and perilous situation. When she dies, it is revealed that she has left one of her most prized possessions, a painting called Boy With Apple, to him—much to the chagrin of her eccentric and murderous old-money family. Soon Gustave has been accused of murder, sending he and Zero on a surprisingly violent (for Anderson) adventure to clear his name and claim what rightfully belongs to him. This surprisingly suspenseful murder-mystery plays out against the backdrop of an S.S.-style gang of thugs portending another war, destined to destroy the old world European aristocratic gentility so courageously embodied by Gustave. And embody it he does, thanks to the astoundingly nuanced virtuoso performance of Ralph Fiennes. In a career filled with flawless turns, it is no small matter to suggest that this could be his finest moment. Cast too frequently in roles that only require him to explore different shades of dark, angry, and brooding—a typecasting set in motion by his breakout performance in Schindler’s List and forever minted by his work as Voldemort in the Harry Potter films—The Grand Budapest Hotel proves that Fiennes is also an utterly genius comedian, Maid in Manhattan notwithstanding. This is a truly dazzling performance, with Fiennes pulling off a lengthy high-wire act of exquisite tonal precision. The ever-so-heightened reading he gives his lines is always perfectly droll without ever becoming overly broad. The rest of the cast, comprising the usual Wes Anderson players with a few welcome additions (Saoirse Ronan! ), are really just there to fill out the roster, although Tony Revolori capably goes toe-to-toe with Fiennes as young Moustafa. Confident, multilayered, and unassumingly intelligent, The Grand Budapest Hotel represents a career high-point for both Anderson and Fiennes.